CDO Idol Cheesedog is a red cheesedog made from hefty meat stuffed with delicious cheese bits. With its reasonable price, Idol is perfect for people looking for delectable food that’s easy on the pocket, and for entrepreneurs who fancy selling great tasting red cheesedogs the practical way . 1. Heat oil for deep frying. 2. On a bowl, combine flour, corn meal, white sugar, baking powder, egg and milk. 3. 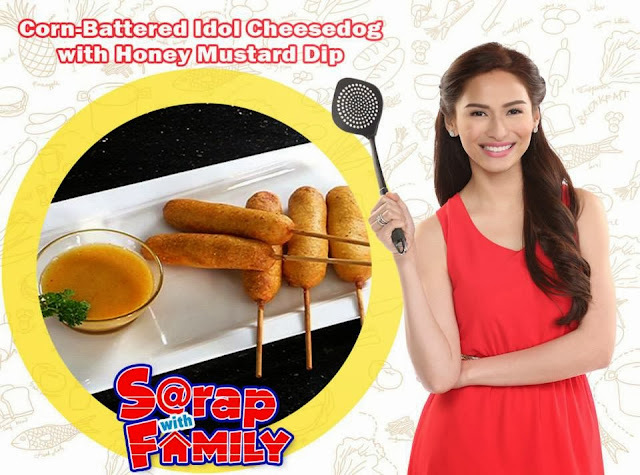 Skewer CDO Idol Cheesedog then dust with flour. Dip into corn meal mixture. Make sure to coat CDO Idol Cheesedog evenly then deep fry until golden brown. 4. For the honey mustard dip, combine mayo, honey and dijon mustard in a bowl then chill until ready to serve. 5. Serve with Honey Mustard Dip!